If becoming a property investor is your goal, remember that purchasing an investment property is just the first step and there are many more ahead to learn how to manage your rental property effectively. The path is a long and tedious one. But if you are smart enough to understand the factors that can help you become a successful property investor then you will achieve your goal within no time. The most important factor of all is to manage your property. You need to realize that there is extremely specific management requirements that you are required to abide by as a rental property owner. The following tips will ensure that your property investment venture meets success. Successful rental property management relies heavily upon how well you keep up with the property maintenance. This is the single most important thing to remember primarily because of two reasons. According to California landlord tenant law, it becomes your legal obligation for keeping the property up to the health and safety standards as determined under law. This would include maintaining the indoor area and outside patio, parking, and common area to throw garbage and areas like garage, garden etc., in good and presentable condition. It will not only make your property appear aesthetically pleasing but also fetch you prospective tenants pretty easily. If your property is not well-maintained you will have to compromise on the tenants and rent. Naturally if the property is rat infested or leaks during rainy season then people won’t be much interested in renting such a unit. Similarly, if you do find prospective tenants then they will only rent the property if you lower the monthly rent. Either way you will be in trouble. Choose your tenants wisely so that you won’t have to evict them soon. The only way to choose good tenants is to properly perform tenant screening by checking personal, professional and financial information that they have provided. Never trust entirely upon information the tenant provides and always crosscheck everything. Ensure that there is minimal noise pollution around the property so as to prevent your tenants from moving out. You need to understand the landlord tenant law if you want to avoid trouble and complexities later on. An in-depth understanding of the law will help in managing the rental unity without any conflict with the tenant. Moreover, it will provide you a productive structure to follow. This structure will be beneficial as you won’t be making common mistakes, which usually land landlords into trouble, and the management process will be streamlined almost effortlessly. For instance, when you have an understanding of the California State’s Law regarding how much security deposit can you collect, when you need to return the security deposit paid by the tenant and the salient reasons based upon which you can evict or not evict your tenants, you will be able to manage rental property effectively. You will be having a clear idea about the process to be followed in case you need to evict your tenant without getting into legal trouble since there are situations where tenants can sue landlords for illegal eviction. You will get to know situations in which the state allows a tenant to withhold rent and the rights /duties of the tenant. You must be familiar with the landlord tenant rules of your state as well as your local town to understand if there are any additional laws that may apply. Think About Hiring A Property Manager? Let’s admit the fact that managing a rental unit is not an easy task at all; it is an extremely demanding and time consuming job that may become overwhelming for landlords to handle at times. If you are finding this job tough and stressful then the only solution to ensure maximum peace of mind is to hire a property manager. A property manager will not only look after the issues of tenants but also make sure that everything is being done according to the law. You will not have to personally deal with all those issues that property investors face frequently. You can hire the property manager to do all or some of the tasks, depending on how much you can handle yourself managing your rental property successfully. For instance, you can ask the property manager to collect rent from the tenant(s) only and look after other issues yourself or you can hire manager to take care of repairs and tenant complaints and collect rent yourself. Do make sure before actually hiring a property manager as to what are those tasks that you cannot personally handle because hiring property management is not at all cheap. Prior to making the big decision, you must analyze the financial pros and cons of the decision and determine if it is the best possible solution. Remember that it isn’t necessary the property manager is as competent and reliable as you anticipate them to be. There is every possibility that the property manager do not perform the tasks you have hired him for with utmost dedication and professionalism and the tenant may complain about his attitude. Therefore, when you decide about hiring property manager, carry out comprehensive screening just like you would perform while choosing tenants and do not trust the manager immediately. Keep certain key tasks managing your property in your hands such as rent collection, and hand over to the property manager only when you have considerable trust upon him. For property investors to make money it is very important to properly manage financial obligations and the most important one of all is to pay the taxes. For rental property owners, tax payment is a confusing task because it is a property and you would want to deduct home office expenses. Please understand that you can deduct salient expenses involving depreciation. We suggest that you hire an accountant having proper understanding of investment property tax law. The accountant will help you learn how to manage your rental property successfully by understanding the deductions that law allows landlords to take and the deductions that can land you in trouble with the IRS. 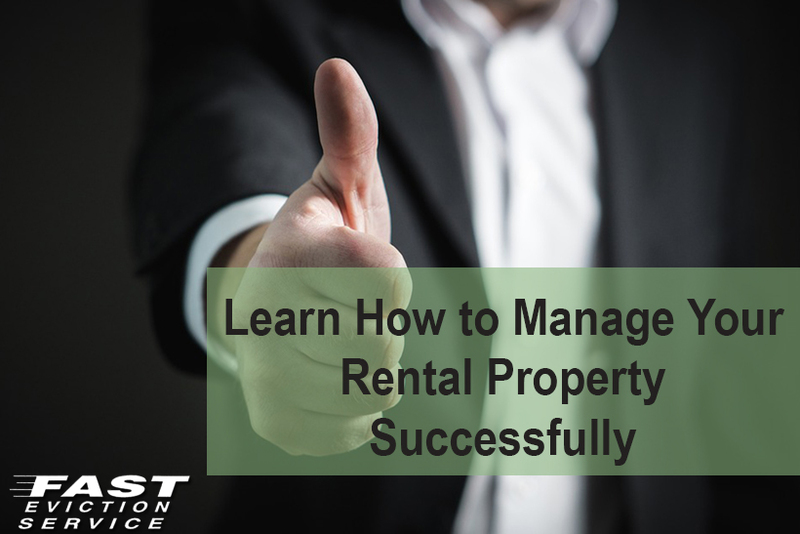 To be a successful real estate investor requires learning to master how to manage your rental property successfully – which can be a formidable and daunting task. Be realistic what you may or may not be capable of managing yourself and the costs of getting outside property management help for part or all of your responsibilities is key.